My recent interest in pop-punk bands (see: Blink 182) led me to pick up the latest release from this Minneapolis band. Referred to as “a leading light in the punk-pop genre” on the AllMusic site, I figured I might as well try them out. 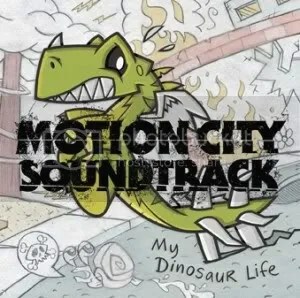 My Dinosaur Life is the band’s fourth full-length album and their first for Columbia Records. It is, indeed, pop music. I don’t know if I would necessarily call this pop-punk because it really doesn’t have a lot of punk rock in it; it is closer to pop-rock than pop-punk. The album isn’t bad by any means and I listened to it three times through without noticing. Herein lies the problem with this album. There isn’t anything that stands out about it; despite my repeated listens, I couldn’t tell you any of the lyrics or what any of the hooks are. Maybe with thirty listens, I’d actually remember something about the album. As it stands, there isn’t anything too memorable on here for me. I guess I liked the song “A Lifeless Ordinary (Need A Little Help)” best but I could be wrong since I can’t remember how the other songs go. This entry was posted on February 6, 2010 at 12:00 pm and filed under TheSlacker. You can follow any responses to this entry through the RSS feed.